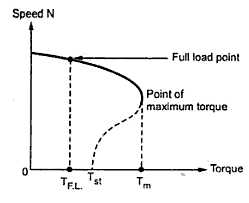 Uptill now, we have seen torque - slip characteristics of an induction motor. To compare the performance of induction motor with d.c. shunt and series motors, it is possible to plot speed-torque curve of an induction motor. At N = Ts, the motor stops as it can not produce any torque, as induction motor can not rotate at synchronous motor. At N = 0, the starting condition, motor produces a torque called starting torque. For low slip region, i.e. speeds near the region is stable and the characteristics is straight in nature. Fall in speed from no load to full load is about 4 to 6 %. The characteristics is shown in the Fig.1. It can be seen from that the figure that for the stable region of operation, the characteristics is similar to that of d.c. shunt motor. Due to this, three phase induction motor is practically said to be 'constant speed' motor as drop in speed from no load to full load is not significant. The unstable region of operation is shown dotted in the Fig.1.